“I worry about him,” said Clayton Christensen, a fellow Mormon, an influential business theorist and a friend of Romney’s. In his office at Harvard Business School, surrounded by certificates and the books he has written — including “The Innovator’s Solution,” “The Innovator’s Prescription” and “The Innovator’s Dilemma” — Christensen argued that Romney should open up more. He said the candidate should talk about the way he navigated acrimonious negotiations between the selling partners and the junior partners at Bain and Co. during a near-mutiny that nearly sank the firm. Nobody knows, Clayton? Really? Well, let me wager a guess. The episode that Christensen is talking about did feature Romney deftly negotiating among Bain & Company partners to save the firm, which had taken out huge loans as part of a plan to let senior partners cash out. But it also featured...a big federal bailout of the firm. As Michael Kranish and Scott Helman note in their indispensable new biography of Romney, a central part of Romney’s rescue plan was that he “convinced the Federal Deposit Insurance Corporation, which insures bank deposits, to forgive roughly $10 million of $38 million in loans owed to the failed Bank of New England.” The bailout was the subject of a tough attack ad created by Ted Kennedy’s campaign for his 1994 race against Romney, an ad that the campaign chose not to air in the final weeks of the race. And it is probably not a subject that Romney wants to be reminding voters of in the post-TARP era, when he is going around the country attacking Barack Obama for having bailed out the auto companies. I’ll say it again—at this point Romney supporters probably need to stop imagining that there are some golden anecdotes out there that, all on their own, are going to magically humanize the candidate. Romney knows talking about his years as a Mormon lay minister means bringing up the time he urged one woman to continue her pregnancy over doctor’s orders, and urged another to give her baby up for adoption or risk being kicked out of the church. He knows telling the story about his and his sons’ Jet-Ski rescue of a stranded motorboat means reminding voters of his huge lakeside estate in New Hampshire. And he surely knows that telling the story about his Bain & Co. rescue means talking about federal bailouts. Heck, the one time in recent weeks when he did try to tell a nice story, he ended up laughing over his father’s layoffs of hundreds of Michigan workers. 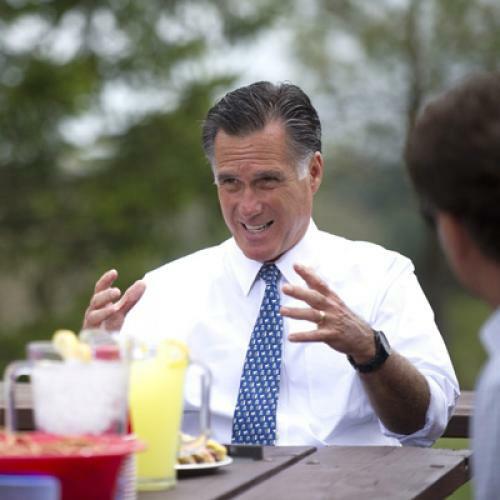 So let’s face it: Romney’s campaign has plenty of reasons to hope for a November win. But anecdotes aren’t going to do it.